The President of the Senate, Dr. Abubakar Bukola Saraki, today raised alarm over a plot by security agents to implicate him using coerced cultists. Speaking during the Senate plenary on Wednesday, May 16th, 2018, the President of the Senate narrated how he learnt of the plot to his colleagues. “ According to the information available to the Governor, the Inspector General of Police, Mr. Idris Ibrahim directed the Commissioner of Police in Kwara State to immediately transfer the men to the Force Headquarters. The plan, as the Governor was made to understand is that, under duress, the suspects would be made to alter the statements they already made in Ilorin. 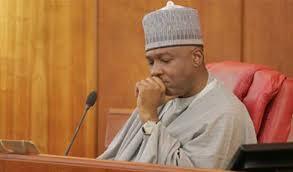 They will then be made to implicate the Kwara State Government, and in particular, myself, in their new statement. “"In my own view, this plot is an act of desperation, blackmail, intimidation, abuse of office and crude tactics aimed at turning our country into a Police State where top officials cannot be made to obey the law, follow due process and subject themselves to constituted authorities. "I want to bring this dangerous development to the attention of all of you my colleagues, the entire country and the international community so that you can be aware of the level of impunity in our country and the danger it constitute to our democracy,” the President of the Senate said. “I know the gravity of the issue that is why I am bringing it to your attention and to continue to let our colleagues and the world know presently the danger we are going with and the levels of the rascality that is going on with some of these actions. I have brought it to your attention and we must continue to play our own role in doing what we believe in the course of our duty.